MFSI provides a full range of certification training throughout Maine. 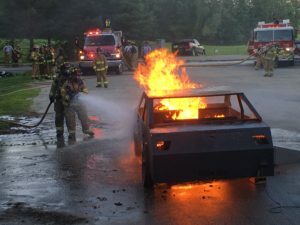 Description: The Kirila Car Fire Trainer for live fire training exercises brings a level of versatility and realism that cannot be duplicated using conventional firefighting training methods. The operator of the trainer will be able to vary the difficulty, complexity or scale of the fires to challenge the skill of the trainees. One advantage is the fact that you can relight fires quickly and get more training evolutions in a typical training evening. This is an excellent tool for roll-up drills and limited incident command training with an element of urgency. NOTE: Prop is unavailable throughout the winter months. November 1st – April 1st weather permitting. 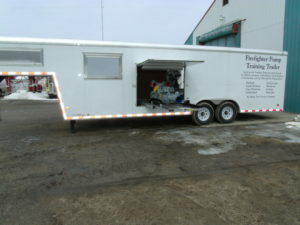 Description: This is a specialty use trailer and requires a trained instructor to operate. 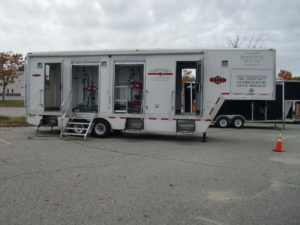 The trailer has many features including wet and dry sprinkler system risers, fire department connection, hose standpipe riser, residential sprinkler system riser, fire alarm system, and wet lab for stopping the flow of an operating sprinkler head. It is a very useful tool for any Fire Fighter I & II program. It is owned by the Town of Scarborough and supported by MFSI. It is on a monthly schedule for use. NOTE: Prop is available throughout the year (has the potential for freeze ups, indoor use in the cold weather months in recommended). The Pump Trailer is dedicated to the memory of Captain Mike Kucsma who was actively involved in the design of the unit.